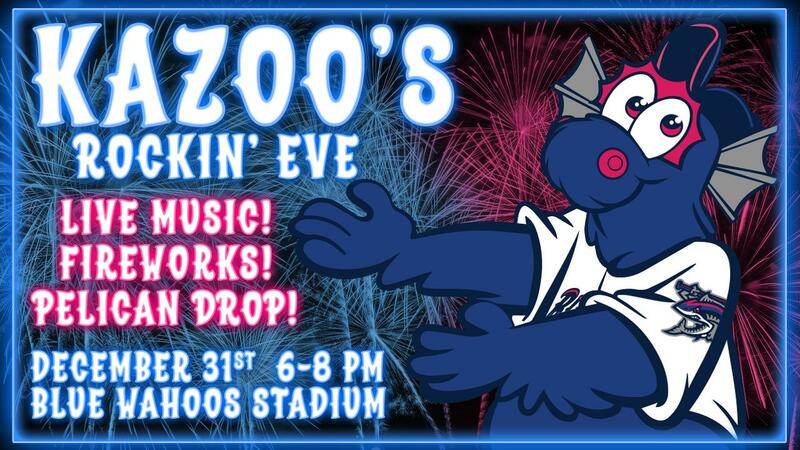 The famed Pensacola Pelican Drop will return to Blue Wahoos Stadium on New Year's Eve for the second consecutive year as part of Kazoo's Rockin' Eve hosted by the Pensacola Blue Wahoos, the City of Pensacola, and Pensacola Parks and Recreation. The family-friendly celebration will run from 6:00-8:00 PM on December 31st, featuring entertainment from two local bands, mascot appearances, on-field activities for children and families, fireworks, and the Pelican Drop. Admission is free to the public. "We are thrilled to have the Pelican Drop return to Blue Wahoos Stadium in 2018," team president Jonathan Griffith said. "It's an honor for us to help this great Pensacola tradition continue and to be able to pursue our mission of improving the quality of life in our community by offering a fun, free, safe, and family-friendly New Year's Eve event." Fans attending Kazoo's Rockin' Eve will be able to enjoy music and on-field activities before taking a seat in the stadium's seating bowl to watch fireworks and the Pelican Drop. The concession stands at the stadium will be open during the event offering food and drinks. In addition to Kazoo's Rockin' Eve, the Blue Wahoos will also host New Years on the Bay in the stadium's Hancock Whitney Bank Club on the same night, a private party featuring a gourmet meal prepared by Executive Chef Jason Perry. Perry, a competitor in the upcoming 2018 World Food Championships, will serve a buffet-style feast with options for both adults and kids from 6:30-8:00 PM and attendees will be able to enjoy dinner, fireworks, and the Pelican Drop from the Hancock Whitney Bank Club overlooking the Pensacola Bay. Tickets to this exclusive event are $75 for adults and $20 for children. Tickets to New Years on the Bay will be available starting November 15 on the Blue Wahoos website, BlueWahoos.com, or by calling the box office at 850-934-8444. The Pensacola Blue Wahoos are the Double-A Affiliate of the Minnesota Twins and a member of the Southern League. For information on 2019 Blue Wahoos tickets, please call 850-934-8444 or visit the team's website at BlueWahoos.com.